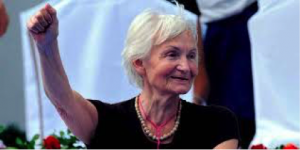 Comrade Margot Honecker, who served as the Minister of People’s Education in the socialist German Democratic Republic (GDR) from 1963 to 1989, was a leading member of the ruling Socialist Unity Party (SED) and the wife of GDR leader Comrade Erich Honecker, died on 6 May 2016 at the age of 89 in the Chilean capital Santiago. She had lived in exile in Chile, travelling there from Moscow, since 1992, after the final revisionist treachery of the Gorbachev clique had destroyed the socialist German state and facilitated its annexation by the imperialist Federal Republic. Among the socialist states of Europe, the GDR had been particularly noted for its internationalism and anti-imperialism. From Vietnam to Korea, from South Africa to Mozambique and Angola, and from Cuba to Nicaragua, its record was outstanding, sincere and generous. Following the US-inspired fascist coup in Chile, which violently overthrew the progressive government of Salvador Allende in September 1973 and ushered in a vicious reign of white terror, the GDR opened its doors to several thousand Chilean refugees. Among them was today’s Chilean President Michelle Bachelet, whose father, an air force brigadier, died as a result of months of torture carried out by the Pinochet regime. Another Chilean given sanctuary in the GDR, Leo Yanez Betancourt, married the Honeckers’ daughter Sonja, so it was scarcely surprising that a democratic Chile should, in turn, welcome Erich and Margot Honecker to live in safety with their daughter, son-in-law and grandson. ” Hundreds of exiled Chilean communists remember and deeply appreciate the solidarity and friendship in which Margot Honecker took an active part – solidarity that reached the Chilean people in the difficult moments of the dictatorship that struck our country from September 1973. Margot Honecker was born Margot Feist on 17 April 1927, the daughter of a shoemaker and a factory worker. Both her parents were members of the Communist Party of Germany (KPD), as later was her brother, Manfred. Following the rise to power of the Nazis, her father was incarcerated first in Lichtenburg and then Buchenwald concentration camp and her childhood home was searched by the Gestapo on numerous occasions. When the Soviet Red Army defeated fascism and reached Berlin in 1945, Margot joined the KPD, which merged into the SED to create a unified party of the working class in April 1946. She worked first as a shorthand typist for the regional trade union federation in Saxony-Anhault, but soon took up leading positions in the Free German Youth (FDJ) and in 1948 became the chair of the Ernst Thälmann Pioneer Organisation. In 1950, at the age of 22, she was elected as the youngest member of the fledgling GDR’s parliament. And, just as Comrade Honecker continued to enjoy the hatred of the imperialist bourgeoisie, she continued to enjoy the fraternal esteem of those on the frontline of the anti-imperialist struggle. In October 2015, Margot Honecker gave an extensive interview to Greek journalist Antonis Polychronakis, which must count as one of her last major political statements. ” If you mean by ‘the events of 1989′, those of the autumn of that year, and particularly the events in the GDR, which I describe as a counter-revolution, one would have to write books about it…That cannot be described adequately with a brief answer. Perhaps only this: There was an objective link between foreign and internal political factors…the so-called reformers [in the USSR] grabbed hold of the central foundations of politics and economics and steered a course toward economic disaster and the destabilisation of society. The end result was the surrender of all Soviet achievements. It was not only that these changes were applauded in the West. Also, in some socialist countries neighbouring the GDR, ‘reformers’ were active and were supported by the West. ” The GDR was involved in this global conflict. In the end, it was part of the socialist community. And in the 1980s, the GDR was also faced with the need to develop or correct its economic policies. There were shortcomings in supply, deficits in social life, which led to dissatisfaction. We had not always done our homework properly – partly from our own inability; partly we were blocked. ” It was not an ‘uprising’. There were demonstrations, but the workers were working on their jobs, the children went to school, social life continued. Most people who went into the streets in the autumn of 1989 were expressing their dissatisfaction. They wanted to make changes and improvements. They wanted a better GDR. They were not demonstrating for its abolition…That there were also hostile forces among the opposition, which mainly gathered under the roof of the Church, cannot be denied. It is clear that the Federal Republic of Germany was able to manipulate those who were discontented and finally to steer the movement for a better GDR. From the cry of ‘We are the people!’ it became ‘We are one people!’ In this way they found the lever they had been looking for since the beginning of the existence of the GDR, that of their declared intention to ‘liberate’ the citizens in the East. Regarding this, we should remember: The Western powers had – working in conjunction with German capital and its pliant politicians – first split Germany and then baptised the German Federal Republic. That contradicted the sense of the provisions of international law making up the Potsdam Agreement of the four victorious powers in 1945, which required a unified democratic Germany. ” A revolution, as I understand it, is a profound social upheaval aimed at the radical transformation of social relations and the liberation of the masses from exploitation and oppression. In this respect, overcoming the reactionary imperialist relations in Russia in 1917, or the creation of an anti-fascist democratic order in 1945 in the Soviet occupation zone in Germany, were revolutions. Capital was deprived of its power to continue to rule over the people. If a reversal is carried out of the social and production relations that had been overcome earlier, and that’s what happened, that cannot be considered a revolution. It is, on the contrary, a counter-revolution. ” In this state, each person had a place. All children could attend school free of charge, they received vocational training or studied, and were guaranteed a job after training. Work was more than just a means to earn money. Men and women received equal pay for equal work and performance. Equality for women was not just on paper. Care for children and the elderly was the law. Medical care was free, cultural and leisure activities affordable. Social security was a matter of course. We knew no beggars or homelessness. There was a sense of solidarity. People felt responsible not only for themselves, but worked in various democratic bodies on the basis of common interests. Red salute to Comrade Margot Honecker! Long live the glorious legacy of the German Democratic Republic!